KILLINGTON, Vt. (AP) — Mikaela Shiffrin made a small mistake halfway through her final run and heard a hush from the crowd below. Only one thing to do — charge even more. Shiffrin powered through the fog in Killington on Sunday to win her third straight World Cup slalom race at the venue. The 23-year-old from Colorado overcame her tiny missteps and got stronger near the finish by the urging of the home crowd. Shiffrin finished in a combined time of 1 minute, 43.25 seconds to edge Petra Vlhova of Slovakia by 0.57 seconds. Sweden’s Frida Hansdotter finished third. After crossing the finish line, Shiffrin needed a moment for everything to sink in. Then, she raised her hands and celebrated with the fans, who helped her know how she was faring on every turn of the course through their cheers or groans. This was World Cup slalom win No. 34 for Shiffrin, tying her with Vreni Schneider for second among women in the discipline. The record of 35 is held by Austria’s Marlies Schild, one of Shiffrin’s childhood favorites. Shiffrin still watches video of the way Schild attacks a course. 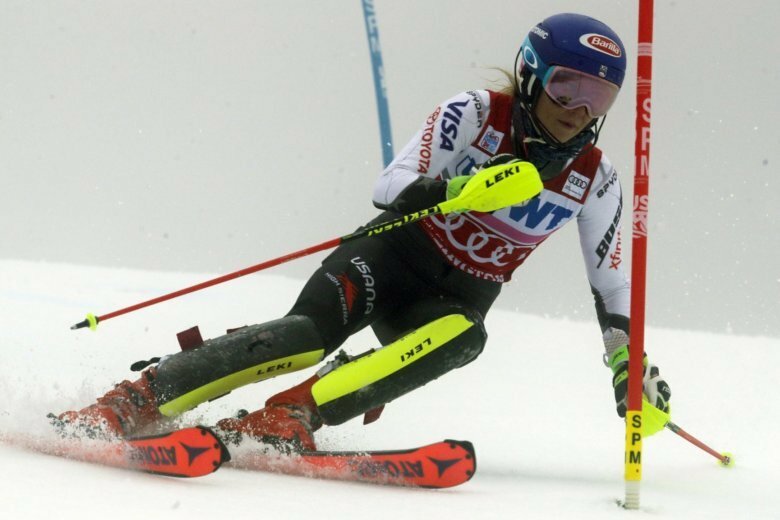 “I feel like she’s the greatest slalom skier of this generation because she was the first,” Shiffrin said. “She was the first one to completely pioneer a new kind of style of skiing. Some of her runs, it was like she belonged with the men. Shiffrin’s 45th overall World Cup win capped off quite a weekend at Killington for her. On Saturday, she was fourth in the giant slalom. The conditions were less than ideal Sunday, given the fog and the drizzle. That didn’t bother her. Shiffrin has been a pillar of consistency in the slalom. Over her last 31 World Cup races in the discipline, she’s been on the podium 29 times, including 25 wins. Next up for the women’s circuit will be speed races in Lake Louise, Alberta. Lindsey Vonn had been scheduled to make her season debut, but she hurt her knee in a training run and will skip the races. Vonn has 82 World Cup victories, leaving her five away from breaking the record held by Ingemar Stenmark of Sweden.